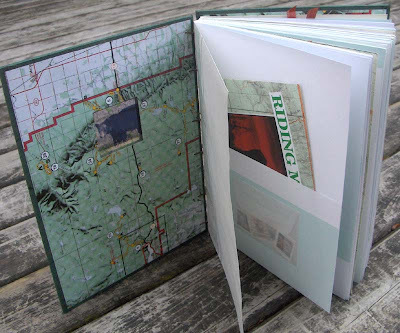 Laura, of PrairiePeasant.Etsy.com, says that Riding Mountain National Park in Manitoba is one of her favorite places to visit so she made this book for our travel book swap. The window on the front features a photograph of a bear printed on a transparency. Laura says she has seen a bear every time she has visited the park - and sometimes too closely! 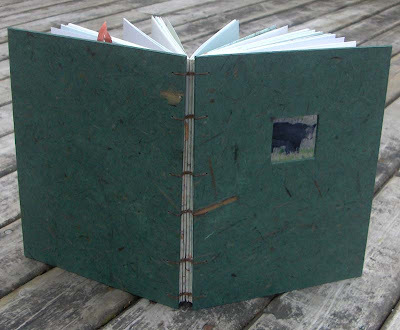 This is a hardcover Coptic bound journal made with reclaimed materials: the covers are reclaimed bookboard covered with handmade paper, the pages are cut from printers' end rolls, and a topographical map of the park is used to wrap each signature. She also made pockets to hold a postcard and tag made with images from park brochures. There is also a little envelope containing some Canadian stamps: a red fox stamp, the Manitoba coat of arms, and a bookbinding stamp. Check out Laura's work in her shop, PrairiePeasant.Etsy.com. this is the book i received and i LOVE it! makes me want to make a trip to canada. thanks so much! Thanks Kristin! I'm so glad you like it! Your book is quite lovely too--I wish I could have all the books in the swap!